Whenever fly tying comes up, verbally or in print, I have programmed a tiny voice in my head to say: don’t go there. 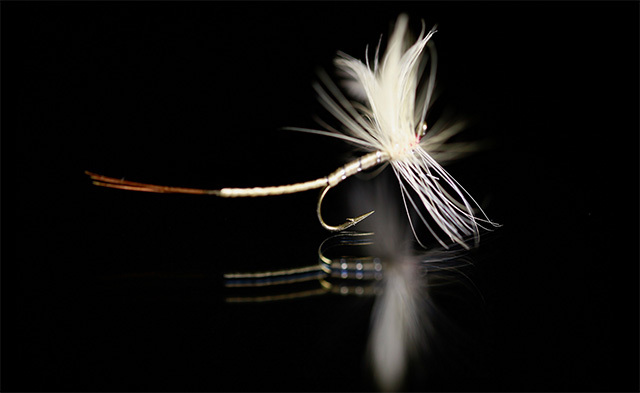 Let’s get this out in the open, I’d positively love to tie flies, and for all the usual reasons: from obtaining a deeper understanding of entomology right through to the satisfaction you derive from landing a fish on your very own pattern. What’s not to like? Despite this, I listen to the aforementioned inner voice. I have to. My sanity somewhat depends on it. The things that I truly love to spend my time doing can be counted on one hand. Fly fishing and cycling are just two of those things. At the start of each fishing outing, whether it’s a full-day affair or just a 90-minute sneak to local waters, I always ask myself if I shouldn’t have gone cycling instead. The exact same thing happens when I decide to zip around on my bike. Considering that enjoyment of both of these activities can be attributed to the exact same weather variables (no rain, clear skies, low wind), you can begin to understand the ‘logic’ that fuels that question. Fortunately, my thoughts settle quickly – and I do end up enjoying the bike ride, or the fly fishing. Now, if I were to add fly tying to the mix, there is no doubt in my mind that I’d at some point go through some form of minor depression. Doing one activity now means forgoing not one but two other activities. I know myself well enough to know that I wouldn’t save the fly tying for cold, rainy nights – when I wouldn’t head out with the bike or fly rod anyway. I know many tiers, and nearly all of them are obsessive about the craft, which makes perfect sense to me. In fact, I wonder if it’s even possible to tie flies without being obsessive, about everything: history, materials, process, tools and technology. Another reason I don’t tie is because I’m a closet librarian. I know full well that I’d spend way too much time keeping all tying materials organized, labeled—heck, probably alphabetized. In just five seconds, I’d be able to locate a tying material I last saw 42 months ago. I have the clarity of mind to see this for exactly what it is: borderline obsessive. Oh, and organizing takes time – time subtracted from other, and what I honestly believe to be healthier, activities: fly fishing and cycling certainly come to mind…. Finally, I can’t accept having an 8,000-fly collection and knowing that I’ll use but 10% of that collection, at most (of the fly tyers I know personally, the one with the “smallest” collection thinks that he has approximately 2,000 flies). Perhaps when I retire, when manual dexterity and vision are on the downward curve, I’ll probably curse myself for not having started tying decades earlier, when I didn’t need 5X magnifier to see exactly what kind of bug that #22 really is. I do sometimes think about what it would be like to spend a Saturday morning tying patterns that my boxes are short of… I’d have two splendid hours to while away… Whoa! Cancel that. Fur and feathers? Not in my house.